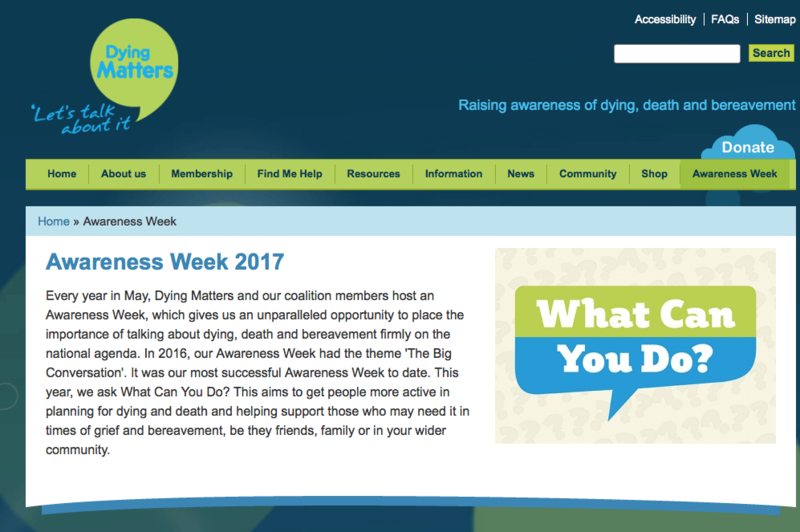 Events which aim to open up conversations around death and dying will be held across the UK during Dying Matters awareness week in May. Including death cafes, art and performances around the topic and valuable information has something for the public and healthcare professionals alike. From the start of the week through to 11 May, Nottingham University NHS Trust will provide display boards outlining the key theme of the week – ‘what can you do?’ – as well as posters and resources for patients, staff and the public. Trust staff also have the opportunity to attend a conference which will focus on celebrating successes and developments in end of life care across the trust with an emphasis on lived experience. The Northern Lincolnshire end of life conference, on 9 May, Let’s Talk About It, aims to help professionals overcome barriers to raising sensitive issues with patients and carers. The conference is being hosted at Forest Pines Hotel and Golf Resort, Broughton. On 9 May a free webinar led by academics and practitioners will consider the support required by people who have been bereaved in high-profile cases or events. The speakers, who include former journalist and University of Strathclyde lecturer Dr Sallyanne Duncan, will advise professionals on how they can best support individuals to deal and interact with the media, and speakers will consider support methods for people whose grief is in the spotlight. The University Hospitals of North Midlands Macmillan Specialist Palliative Care Team is hosting a conference for specialist nurses, GPs, doctors, commissioners, registered nurses, hospice staff, nursing home staff and students on 11 May at the Best Western Plus in Stoke-on-Trent. It aims to increase knowledge and understanding of advance care planning and current themes and research in palliative and end of life care. In South Wales, also on 11 May, anyone can go along to a one-day event to speak to will writers, funeral planners, hospice representatives and others involved in end-of-life care. This event will be held at the Y Centre in Porthcawl between 10am and 4pm. NHS Warwickshire North CCG, George Elliot Hospital NHS Trust, Mary Ann Evans Hospice and Myton Hospices are hosting a Good Death Café on May 11 at Polesworth Tithe Barn Hall. The event is open to the public and professionals to find out what services are available in the area for people who have been bereaved and those approaching the end of their lives. On Friday 12 May a free coffee morning will be held at the Kirkburton Hub, Huddersfield, giving people the chance to speak to West Yorkshire Fire Service, West Yorkshire Police, Age UK, Arthritis Care, Time Together, Valleys Community Transport, around the themes of arthritis, dying matters, deafness and dementia awareness. In Cambridge on 13 May the Jesus Lane Friends Meeting House will host a Dying For Life Festival. The event will include information, art, ideas and conversation about dying and death, as well as a one-woman show by Liz Rothschild in the evening. For full event listings and details see www.dyingmatters.org/events. Also find more in our archive, for example here and here.